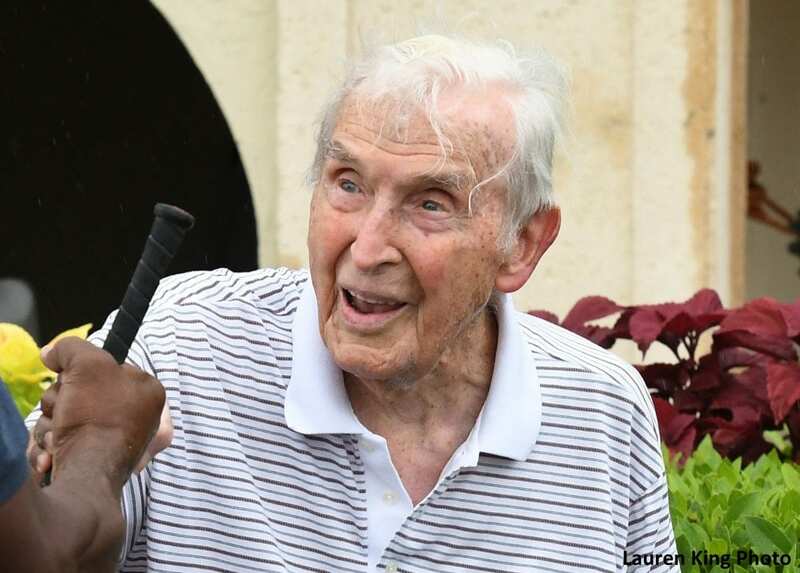 When Gusty Wind drew off to win Saturday's fifth race at Gulfstream Park by 3 ¾ lengths, Jerry Bozzo, 97, maintained his status as the oldest trainer to win a race in Thoroughbred racing history while breaking the record he set last year. A graduate of Carnegie Tech (now Carnegie Mellon University) and Massachusetts Institute of Technology, Bozzo celebrated his 97th birthday last Oct. 25. The retired aeronautical engineer, industrialist and World War II veteran sold his Pennsylvania bottle manufacturing company in 1969. He has been breeding and training Thoroughbreds in South Florida since the 1970s. Bozzo became the oldest trainer to win a race June 3, 2017 when he sent out Cotton Tooyah for a 4 ½-length victory at Gulfstream Park. He surpassed the record of the late Noble Threewitt, who visited the winner's circle for the last time two months after celebrating his 95th birthday. Threewitt, who was born Feb. 24, 1911, was credited with being the oldest trainer to win a race when Threeatonce captured a maiden claiming race at Santa Anita on April 22, 2006. Bozzo had already become the oldest trainer ever to saddle a stakes winner when homebred Flutterby won the Sea Lily at Gulfstream on May 30, 2015 before going on to finish second in the Princess Rooney (G2) and win two more stakes. Gusty Wind ($14.80) rated far off the early pace under jockey Luca Panici before making a sweeping run on the turn into the homestretch and drawing clear to break his maiden in his sixth career start. Bozzo, who still actively trains a small stable at Gulfstream Park West, is also the breeder and owner of the 3-year-old son of Indy Wind. This entry was posted in NL List, People and tagged Flutterby, Gulfstream, gulfstream park, gutsy wind, Jerry Bozzo, luca panici, oldest trainer by Press Release. Bookmark the permalink.